“Active” may not be the approach that immediately comes to mind in income investing. But as the fixed income markets have reminded us recently, taking an active approach can be key to both controlling risk and capturing yield. Consider the recent move in the 10-year Treasury bond, which started December at a 17-month high after a substantial rise in November. 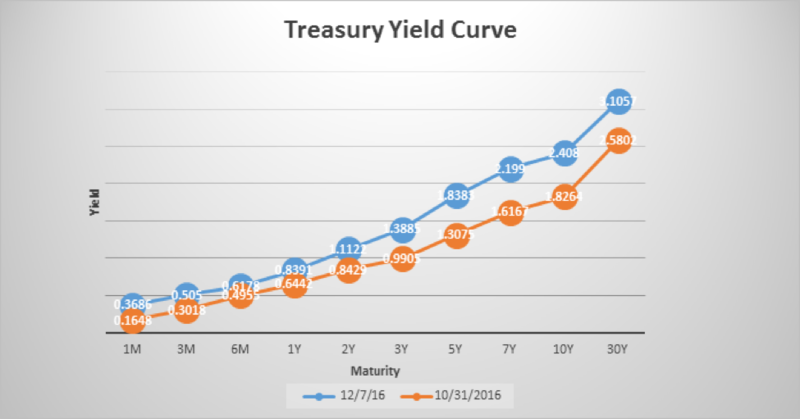 Following October’s rising rates, the U.S. election set off a dramatic upward move in the Treasury yield curve. Overall, since July, the 10-year yield has risen by more than 1 percentage point—marking only the fourth time it has risen that fast since 2009. This shift was felt across the global markets, including in bonds, as the Barclays Global Aggregate Bond Index had its worst month since the summer of 2003. Combined with an almost 1% drop in October, the two-month move in bond prices is on par with the so-called “taper tantrum” of 2013, when yields rose dramatically over a period of four months while government bonds came under significant pressure. There are certain realities as we move forward. The new administration faces some issues early on next year, including the debt ceiling to be addressed March, which could impact fiscal spending plans—especially if proposals are unfunded. But if those hurdles are overcome (read: expectations move toward reality), this could add to an already improving economy, which would likely be supportive of higher rates. In our view, following such a large move in the 10-year Treasury bond, it’s impossible to say if the next 25 basis point move will be up or down. But we believe a change in rate inertia is upon us, and the trend seems to be for higher, not lower, rates moving forward given the current economic environment and an economy that has been picking up even without stimulus plans in place. Meanwhile, with the Barclays U.S. Aggregate Bond Index duration near multi-decade highs, while yields are in the lower end of the multi-decade range, income investors have had to absorb more risk to maintain yield—a common theme in the markets these days. So how can investors approach their income portfolios going forward? Diversifying rate-sensitivity risks, to our way of thinking, appears to be a reasonable place to start. Even if you subscribe to the theory that this move is overdone, there is still the likelihood, in our view, of having to contend with a good deal of interest rate volatility. This means adding strategies to complement traditional passive holdings can help to balance out a portfolio. The issue, though, is knowing when to make these changes. At Astor, we take a macro approach to active asset allocation, including in fixed income investing. This approach allows us to see risks developing from the top down and adjust exposure to broader risk variables. Our Active Income Strategy addresses this head on, specifically as we seek to assess risk and identify opportunities across the capital market spectrum, by diversifying both credit quality and duration/interest rate exposure. An active approach allows us to select from assets with differing risk and yield profiles. 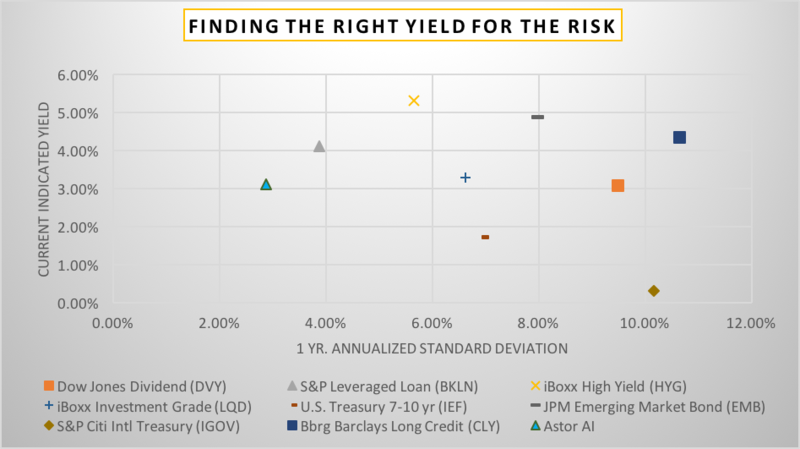 By selecting from non-correlating, income-generating assets, we believe the portfolio can provide a better risk-to-yield profile and complement traditional income based strategies to help achieve better long-term result. Past Performance is no indication of future results. When investing there are multiple factors to consider. The above information should not be used as the sole determining factor for your investment decision. In summary, an active income strategy with the ability to adjust duration, credit quality, and allocate to other asset classes, in our view, can provide both diversification and risk management. The combination of assets with varying correlation, risk and yield profiles can further diversify the portfolio, manage risk, and reduce the impact of one variable—interest rates—on a portfolio. Given the prevailing economic trends and market conditions, we believe this approach is vitally important today. At the time of writing, Astor Investment Management held GSY, BKLN, SRLN, AGG and LQD.among its universe of ETFs included in its multi-asset portfolios. Astor Investment Management is a fundamentally driven quantitative asset manager that seeks to empower clients with economics-based tools and portfolio solutions to reduce risk and help attain investment goals.